Legoland Hotel Located in Johor Bahru, Malaysia. LEGOLAND Hotel attached to Legoland Themepark located in Nusajaya Johor Bahru. Treat your family to the ultimate LEGO® experience at LEGOLAND® Malaysia Resort. Spend the day at the LEGOLAND Theme Park and Water Park and stay overnight at the all-new LEGOLAND Hotel! From the moment you arrive at the spectacular dragon-guarded entrance, you'll be delighted by interactive LEGO features, themed play areas, kid's entertainment and family restaurant with amazing LEGO models everywhere..
Take Tuas / Nusajaya / Pontian / Tanjung Pelepas EXIT 253 > Proceed to Nusajaya EXIT 312 > LEGOLAND® Malaysia Resort signage will lead you to the destination! 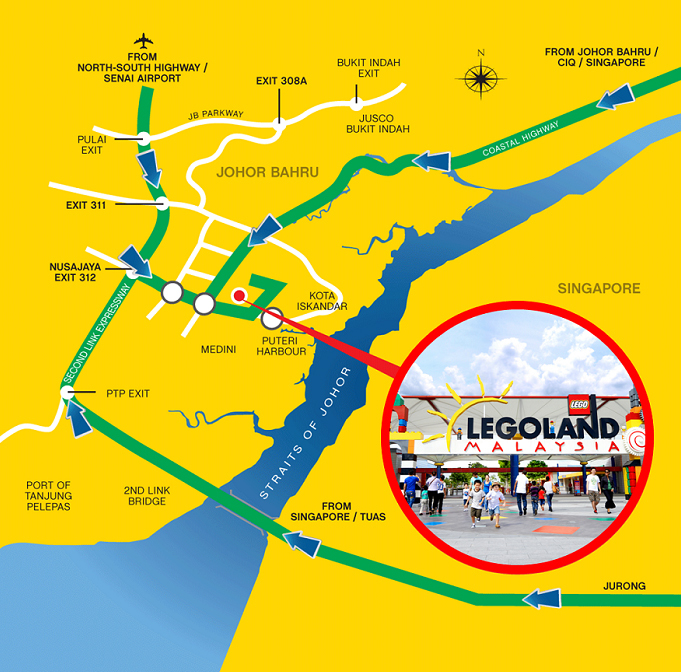 From Danga Bay, proceed straight via the Coastal Highway > Proceed all the way to Nusajaya > LEGOLAND Malaysia Resort will be seen before reaching Kota Iskandar. Ahoy there, mateys! Take a breath-taking step into Captain Red Brick and his first mate’s pirate cabin. Your whole ship will be decked out with pirate bedding, curtains, wallpaper and even Polly, a LEGO parrot, can be found watching over you as you sleep! After a jolly adventure on the rides in the Park, send your junior shipmates up to their private bunks while you relax in the king-size cabin. So, me hearties, book your pirate room today for an unforgettable family treat. Shiver me timbers. Upgrade to a Premium Themed Room for an even greater LEGO adventure! Premium Themed rooms include extra theming and LEGO models. The LEGOLAND Hotel is providing many child friendly features – from secret whoopee cushions and tight-rope walking marching guards through to quirky themed lifts, exploding toy boxes, and dragons. From the amazing entrance right through to the Bricks Family Restaurant, Skyline Bar and breath-taking outdoor seating area overlooking the Theme Park, iconic brand LEGO is everywhere you look. Truly a child’s paradise! After an exciting day in the park, just take the family to the Bricks Family Restaurant and relax as your children enjoy a bit of organised LEGO chaos with colourful characters, great family food and staff who fully understand high spirits. The menu’s been created with children firmly in mind so there’s a wide range of options to suit every taste and age group. If you don’t fancy formal dining (well, as formal as a LEGO restaurant can be!) then there’s always the stunning Skyline Bar serving drinks throughout the day.